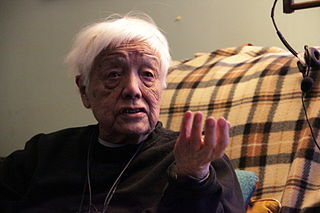 Grace Lee Boggs at her home in Detroit in 2012.
with permission by the University of California Press. Detroit is a city of Hope rather the a city of Despair, The thousands of vacant lots and abandoned houses provide not only the space to begin anew but also the incentive to create innovative ways of making our living—ways that nurture our productive, cooperative, and caring selves…. As Detroiters we were very conscious of our city as a movement city. Out of the ashes of industrialization we decided to seize the opportunity to create a twenty-first century city, a city both rural and urban, which attracts people from all over the world because it understands the fundamental need of human beings at this stage of our evolution to relate more responsibly to one anther and to the Earth. In pursuit of this vision we organized a Peoples Festival of community organizations in November 1991..to redefine and re-create a city of Community, Compassion, Cooperation, Participation and Enterprise in harmony with the Earth.1 A few months later, to engage young people in the movement to create this new kind of city, we founded Detroit Summer.. to rebuild, redefine, and respirit Detroit from the ground up. Detroit Summer brought us into contact with the Gardening Angels, a loose network of mainly African-American southern-born elders, who planted gardens not only to produce healthier food for themselves but also to instill respect for Nature and process in young people. Getting starter kits of seeds and receiving tiller services from the city..these elders worked closely with youth from Detroit’s urban based 4-H programs, involving them in all aspects of gardening, nutrition and food preservation. 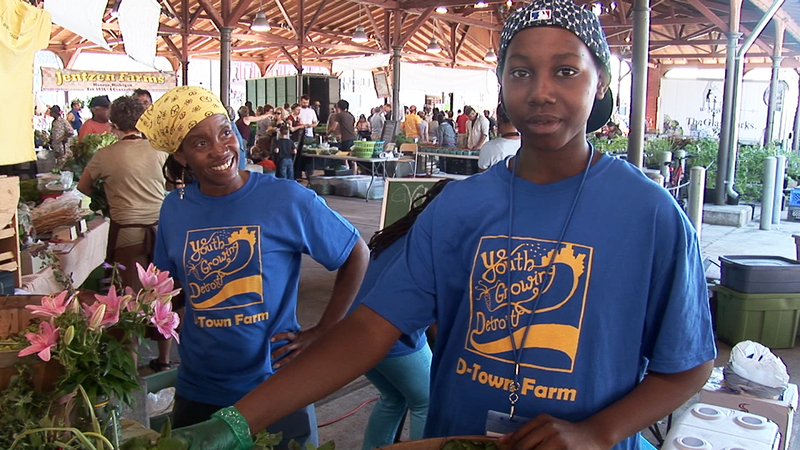 What has developed through both conscious organizing drives and the actions of many individual residents is a significant urban agricultural movement in Detroit. All over the city there are thousands of family gardens, more than two hundred community gardens, and dozens of school gardens. All over the city there are garden cluster centers that build relationships between gardeners living in the same area by organizing garden workdays and community meetings where participants share information on resources and how to preserve and market their produce. These clusters are providing a space of grassroots leaders to emerge. This movement is very clear about the tangible benefits of urban agriculture: it provides fresh nutritious food, beautifies neighborhoods, creates neighborhood social capital, advances neighborhood economic development, stabilizes communities, and provides sustainability. But it also provides concrete examples of alternative, value-oriented means of securing our livelihoods. Detroit has arisen within the broader context of the emergence of national environmental justice movement. The web of connections we have established through our community working in Detroit has continued to expand exponentially. A stream of visitors—ranging from youth to elders, veteran activists to those just getting involved, and celebrities to everyday people—have come to visit the city to witness the birth of a revolution and spread the message beyond Detroit. Among the hundreds of people to which the Boggs Center has given historical and political tours of the city are community activists of all races, prominent academics, elected officials, student groups studying urban issues or engaged in service-learning projects. At the same time Detroit Summer has hosted students from schools across the nation, such as Macalester College, the University of Minnesota, Oberlin, Antioch, UC Santa Cruz, Oakland University, Wayne State, and the University of Michigan. While I believe that the urban agricultural movement carries a special significance in Detroit, I do not mean to suggest that such activities are only taking place here. Indeed, urban communities across the nation, faced with the consequences of deindustrialization, have gone back to the farm. 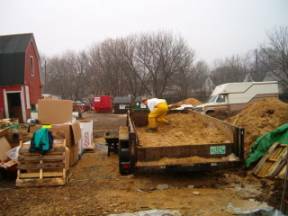 One of the most inspiring examples I have witnessed is Growing Power, a two-acre urban farm on the northwest side of Milwaukee, Wisconsin, where I attended a training session in March 2006. It was an unforgettable experience for me and the approximately seventy other participants, including youngsters and oldsters from all over the country and many different backgrounds. For example, I was in a project-planning workshop with Wesley, a thirteen-year old African-American middle schooler from the neighborhood, and Hank, a middle aged Puerto Rican psychiatrist interested in a similar urban farm in his Rochester, New York, neighborhood. Will began with a vision—a vision of Independence, independence from poverty, from chemicals, from far-off food sources, from farming techniques that are no longer viable given our ever-dwindling supply of farmland and fossil fuels, and also from the illusion that communities can exist without individuals accepting responsibility. 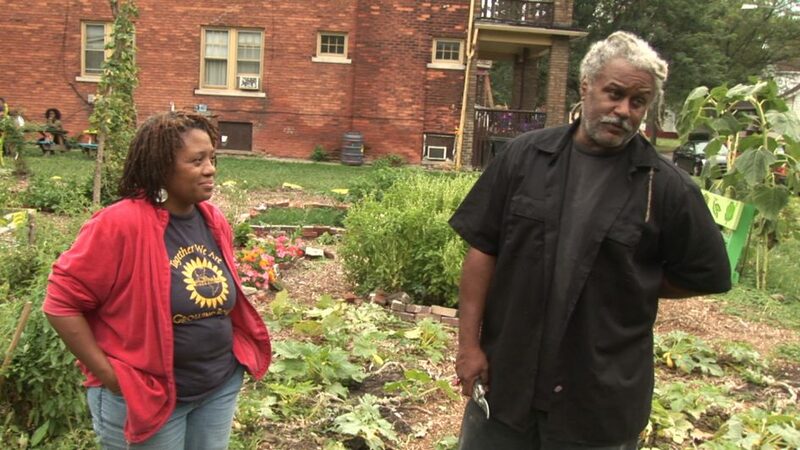 Boggs Center – Wayne Curtis and his wife Myrtle, founders of Feedom Freedom Growers began growing food on a small piece of vacant land beside their house in a neighborhood filled with boarded-up houses, empty lots, and liquor stores. 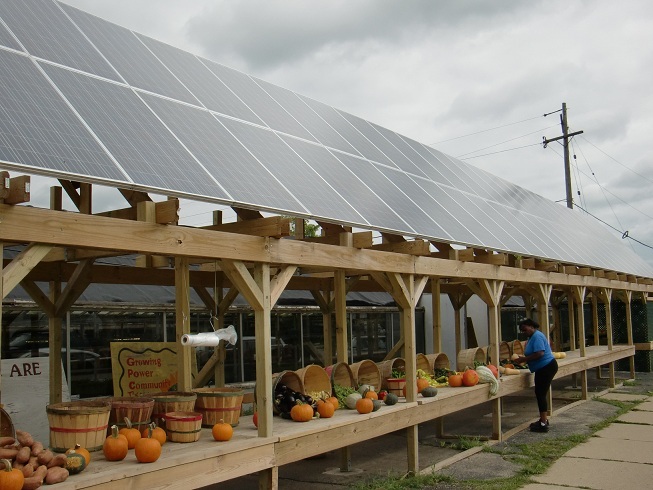 As a result, Growing Power has blossomed into a model food system that now includes year-round food production; sustainable energy and waste management; sales, marketing, and planning; and professional training, especially of urban youth and immigrants. Its Farm-City Market Basket Program provides a weekly basket of fresh produce grown by members of the Rainbow Farmer’s Cooperative to hundreds of low-income urban residents at a reduced cost. I was especially fascinated by the Youth Corps program, which starts kids out when they are eight or nine and works with them until they go to college. Kids get what the schools don’t provide. They work hard, learn how to think on their feet, and are challenged to solve problems instead of giving up and complaining when something doesn’t work out immediately. When I think of this incredible movement that is already in motion, I feel a connection to the women in India who sparked the Chipko movement by hugging the trees to keep them from being cut down by private contractors. I also feel our kinship with the Zapatistas in Chiapas, who announced to the world on January 1, 1994, that their development was going to be grounded in their own culture and not stunted by NAFTA’s free market. And I think about how Detroiters can draw inspiration from these global struggles and how—just as in the ages of CIO unions and the Motown sound—our city can also serve as a beacon hope. As I witness and participate in our visionary efforts to revitalize Detroit and contrast them with the multibillion dollars’ worth of megaprojects advanced by politicians and developers that involve casinos, giant stadiums, gentrification, and the Super Bowl, I am saddened by their shortsightedness. At the same time I rejoice in the energy being unleashed in the community by our human-scale programs that involve bringing the country back into the city and removing the walls between schools and communities, between generations, and between ethnic groups. And I am confident just as in the early twentieth century people came from around the world to marvel at the mass production lines pioneered by Henry Ford, in the twenty-first century they will also be coming to marvel at the thriving neighborhoods that are the fruit of our visionary programs. My hope is that as more and different layers of the American people are subjected to economic and political strains and as recurrent disasters force us to recognize our role in begetting these disasters, a growing number of Americans will begin to recognize we are at one of those great turning points in history. Both for our livelihood and for our humanity we need to see progress not in terms of “having more” but in terms of growing our souls by creating community, mutual self-sufficiency, and cooperative relations with one another. 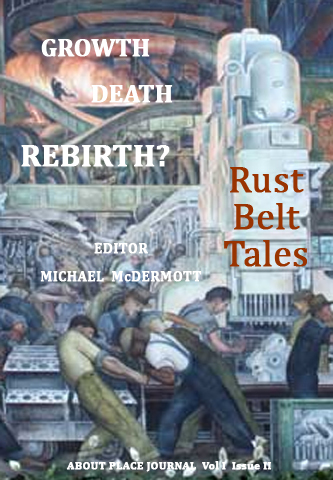 Living at the margins of the post industrialist capitalist order, we in Detroit are faced with a stark choice of how to develop ourselves to struggle. Should we squeeze out the last drop of life out of a failing, deteriorating, and unjust system? Or should we instead devote our creative and collective energies toward envisioning and building a radically different form of living? This is what revolutions are about. They are about creating a new society in the places and spaces left vacant by the disintegration of the old; about evolving to a higher Humanity, not higher buildings; about the Love of one another and of the Earth, not Hate; about Hope not Despair; about saying YES to Life and NO to War; about the change we want to see in the world. 1. Grace Lee Boggs, Living for Change, 231-32. 2. Solnit, “Detroit Arcadia,” 73. Grace Lee Boggs is an activist, writer, and speaker whose seven decades of political involvement encompass major U.S. social movements. Daughter of Chinese immigrants, Boggs received her Ph.D. in Philosophy from Bryn Mawr (1940). She developed a twenty-year political relationship with black Marxist, C.L.R. James, followed by Civil Rights and Black Power Movement activism in Detroit in partnership with husband and black autoworker, James Boggs (1919-93). Grace Lee Boggs’s published writings include Revolution and Evolution in the Twentieth Century (with James Boggs, Monthly Review Press, 1974; reissued with new introduction by Boggs, 2008); Conversations in Maine: Exploring Our Nation’s Future (with James Boggs, Freddy Paine, and Lyman Paine; South End Press, 1978). At age 95, Grace remains involved as a community activist. Her honors include honorary doctorates from 4 universities; lifetime achievement awards from the Detroit City Council, Organization of Chinese Americans, Anti-Defamation League (Michigan), Michigan Coalition for Human Rights, Museum of Chinese in the Americas, and Association for Asian American Studies; and a place in the National Women’s Hall of Fame and Michigan Women’s Hall of Fame. Scott Kurashige has been collecting the speeches and writings of Grace Lee Boggs for the past ten years. The Next American Revolution is a product of his editing these works and crafting them into a single volume in consultation with Boggs. Kurashige is an associate professor of American culture and history and director of the Asian/Pacific Islander American Studies Program at the University of Michigan. His first book, The Shifting Grounds of Race: Black and Japanese Americans in the Making of Multiethnic Los Angeles (Princeton University Press, 2008), received the 2008 History Book Award from the Association for Asian American Studies and the 2008 Albert J. Beveridge Book Award from the American Historical Association for the best book in English on the history of the United States, Latin America, or Canada, from 1492 to the present. With over two decades of experience as a campus and community activist, he is currently a board member with the James and Grace Lee Boggs Center to Nurture Community Leadership in Detroit.